It’s old fashioned to receive personalized service but when booking your Holiday vacation that’s what you can expect. Whether you contact us, by phone or Email, Karen, Lauren, Natalie and Jesse are in our office ready to help you. With collectively over 50 years experience they know what they’re talking about and will take the time to share their trip and area knowledge with you. They get out of the office often to enjoy our trips or find new outdoor adventures. It’s this perspective that allows them to listen to you and help you find the right trip for your needs. When it’s all said and done, our experience outside the office is most valuable when we share it with you! I found my way to Holiday River Expeditions quite by chance. While working at Alta, UT pondering my “summer gig”, a co-worker suggested I try this local river company that he worked for. Thinking only that I had found my summer job has transitioned into a 26+ year career. Originally from Virginia, I always tell people I came to Utah for the skiing but stayed for the rivers. 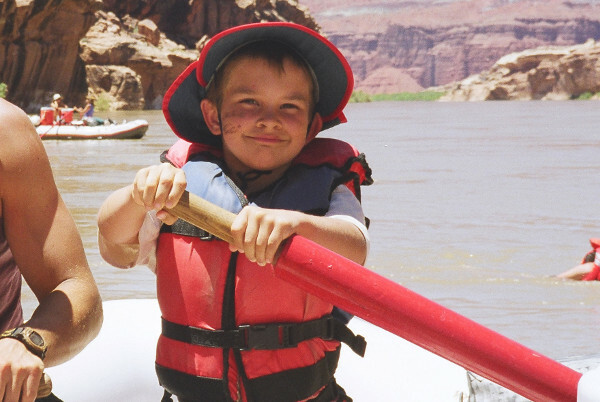 I feel fortunate to have been able to raise my children around mountains and river canyons. 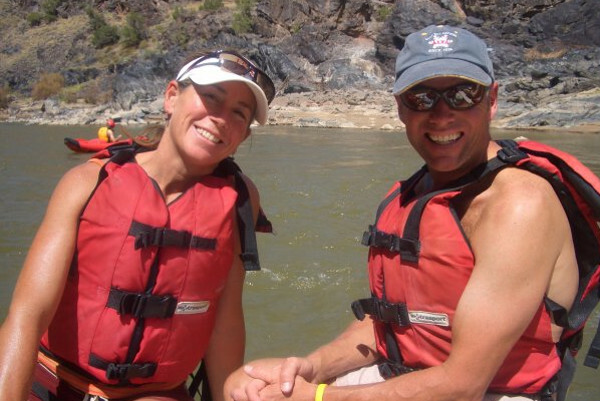 Besides getting out to test the product as often as possible, my favorite part of the job is helping my customers choose their rafting or biking vacation. Most I know by name when they call year after year, but I am always looking forward to helping the next first time rafter discover the powerful pull of these amazing experiences . When work doesn’t feel like work you know you are in the right place. I have been a river runner my entire life and ever since my first river trip at age two muddy water has run a current through my veins and into my heart. Growing up I marveled at the stark contrast between a busy urban environment like Salt Lake City and the untamed tranquility I would find between two canyon walls. My adolescent summers were spent learning life lessons while lounging upon Holiday rafts: the greatest sense of pride comes with a good work ethic, one person can go far but one can go much farther working within a team, the river like life only flows in one direction… and don’t touch the poison ivy! It was learning from the boat-women and men of the 1990′s that led me to find my own oars. When I’m not on a boat, I spend my time in Salt Lake City. I now help run the Holiday River office and spend my free time as a climate justice activist. Working on a number of regional campaigns, I’m the Director of the Green River Action Network, an affiliate program with Waterkeeper Alliance and Utah based Living Rivers. I find that the lessons from the river inform my organizing work and truly all aspects of my life. I love investigating the way natural cycles could work with our cities and influencing the currents that direct and shape our communities. I was born and raised in Salt Lake City, and grew up in a family that spent a decent amount of time outdoors. Exploring Utah’s beautiful landscape was always a great way to spend my free time, but I had never considered I could turn such an incredible playground into my workplace. Then in 2014 a friend of mine asked, or nearly forced me to go on a river trip with him. During that trip down the Yampa River I had the realization that I was ready for a change. 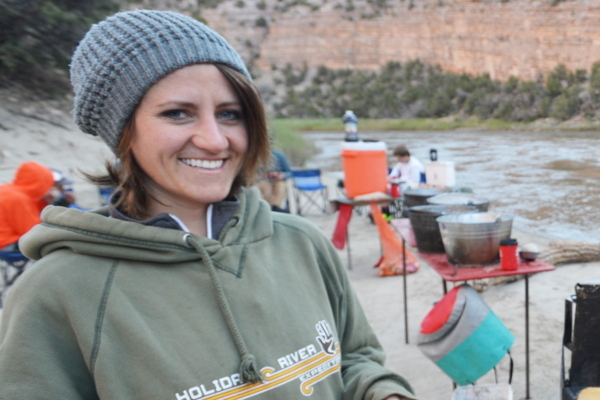 Exactly two weeks from the end of my trip I was in Green River working for Holiday River Expeditions. Tim started me off as a driver. By the time 2016 rolled around I was driver, errand girl, event planner, grocery shopper, and well the list goes on. Tim must have seen my OCD ‘Speedy Gonzales’ work ethic and figured he better utilize it. Finally in September of 2016 Holiday offered me a year round position with the company. I now work in the office heading the social media department, processing documents, and helping with whatever needs to be done. I’m grateful everyday for the opportunities this company gives me. I get to work for a company I respect, with people who have quickly become family, in an environment that rivals most. I get to escape the daily grind, and lose myself in the beauty of the river. And I get to show my son what it means to be happy in the work you do, and share with him the joys this state has to offer. I’m Jesse or “JD”, and I’ve been a part of Holiday’s office staff since 2014 and rafting since my prenatal days. I provide support around the office in whatever mode is needed. And be warned, I’ve been known to rally legendary water fights on hot river days! I currently work part time for Holiday while finishing up a degree in public and consumer health. Since childhood, I’ve had the great fortune to be immersed in a community of river mentors and family, all of whom instilled within me a deep respect and appreciation for the wild and natural. I’ve experienced first-hand the transformative powers of a river trip. A river trip provides the ultimate reset button when the body, mind and soul need a release from day to day life and stressors. I have a robust passion for the preventative side of health and as such, enjoy working for a company that embodies and promotes so many dimensions of good health and well-being. 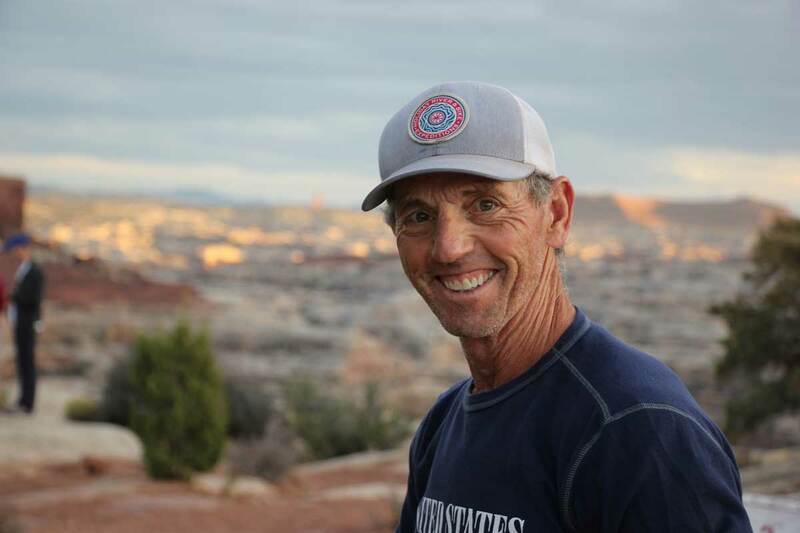 John Wood, our Co-Owner and President, started as a rafting guide and quickly worked his way to the office. From behind the scenes with both his creative and business background he led Holiday River Expeditions to the company we are today. 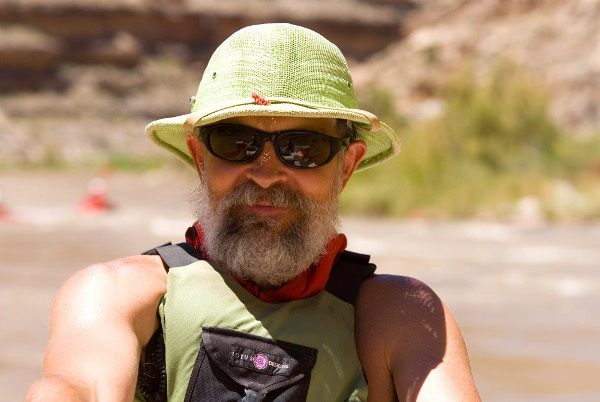 John Wood, co-owner, president, back-up phone help, computer fixer, programmer, creative director and raft guide, with Holiday River Expeditions for 37 years. When you arrive at the meeting point for your trip you’ll be met by a staff of Guides, Warehouse Workers and Drivers under the direction of our Operations Director Tim Gaylord. Tim has been with Holiday River Expeditions since 1978. His attention to detail, and his ability to single out the folks who possess the qualities essential to becoming the best guides in the business are surpassed by none. 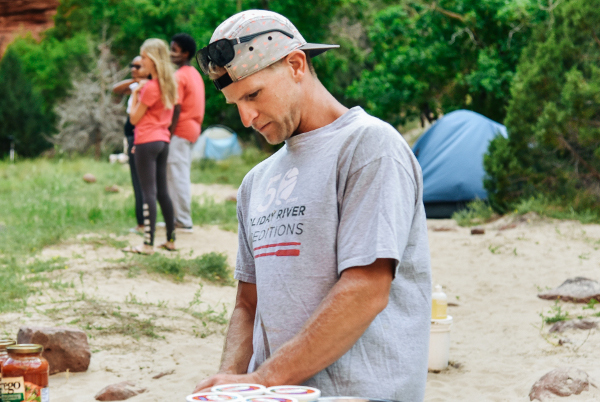 This and his higher than the average human energy level, is the magic behind our seemingly effortless outfitting of all Utah raft and bike trips. Our Vernal operations are managed by another Holiday all-star Ben Levine, known by many as “LB”. Ben has been in the Holiday fold since 2003, when he got his start in the warehouse. Learning his craft from the ground-floor up, Ben has internalized all the intricate details of the elegant design that is Holiday’s operations. His attention to both detail and big-picture trip components mean every Vernal trip is sent off with a mark of excellence. While Ben is often found tuning operations in the Vernal warehouse, he is just as likely to be doing what all guides love best: running some serious white-water. His Go-Pro video footage has become “viral” online, making Ben one of our most laudable guides to date; Vernal couldn’t have better hands on the oars. You know the saying behind every great man is a great woman? Well in Tim’s case that would be Kelly Dunham. With Holiday River Expeditions since 1984. 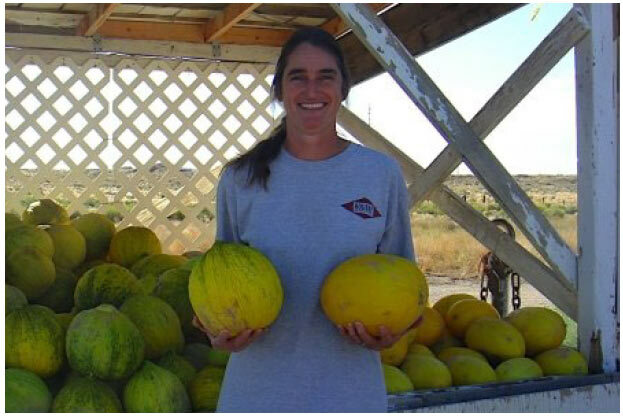 Kelly is part-time now, with an organic farm she shares with her husband Ric, and another job in Moab. However, she is still full-time when it comes to her dedication to keeping the order at our Green River Headquarters when Tim is in Salt Lake. Part mother hen, part bulldog, she knows how keep a crew of 40+ on task! In Idaho, with any luck, you will have the experience of meeting “Frogg”. Harold “Frogg” Stewart was one of Dee Holladay’s original guides. 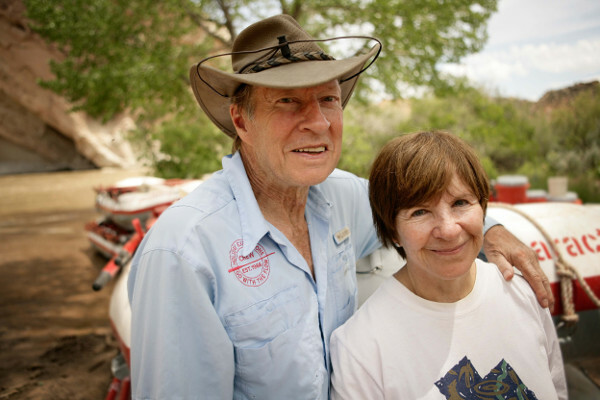 He started guiding in Utah in the early 70’s and then took the show on the road to Idaho. He is co-owner of our Idaho operation and wears all the hats. Manager, warehouse, driver, problem solver, and one heck of a boatman. More behind the scenes these days than out on the river, but you still feel his influence on the trips. He has a dedicated crew of guides who have been with him since the early days. And finally, the two folks who started it all, and the reason most of us are still here, Dee and Sue Holladay. The summer of 2015 marked a watershed moment for our company as we have had to say goodbye to Dee, our founder, moral compass and river-father. 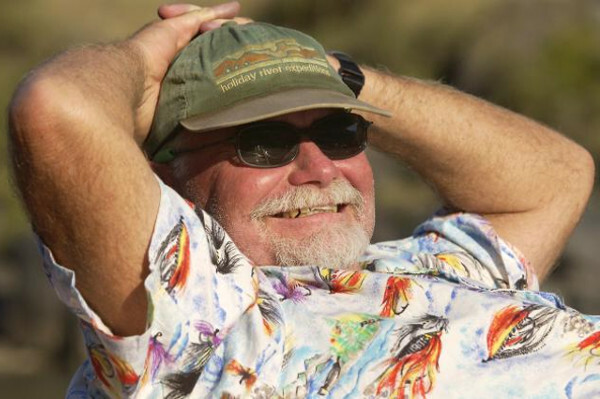 His presence will be missed not simply by Holiday, but the entire rafting community. Sue Holladay, while largely retired, still gives her magic touch to the menus. despite the loss of Dee, their vision and the tone they set for the company still resonates profoundly. The roots are planted deep as they say, as deep as the river runs. Your Holiday River Expeditions experience from the first contact with a voice in our office to the book you pull from the library can on the river are all tied back to the special care Dee and Sue took with growing this business. Attention to detail, always looking for the better way, with care for our environment and thoughtfulness for our guests.